These days, good customer retention strategies and customer service best practices are at least as important as keeping your doors open and your shelves stocked. In other words, they aren’t all neutral, and the ones who are neutral could be persuaded to like your store, or to dislike it. Think of the engaged customers as your friends: they’re likely to stick with you even if things don’t always go the way that they want them to. And think of the disengaged customers as an unfriendly bunch: for a variety of reasons, thy don’t like you, and they aren’t inclined to give you a chance. And those either-way customers? Right now, they could be listening to your friends – or to what your unfriends are saying about you. And most of your customers are in the either-way group. In other words, the ball’s in play – and the more people you’ve got on your team (the engaged customers), the more likely the ball is to stay in your hands. Every engaged customer means more sales, and more positive word-of-mouth. That’s free advertising – an engaged customer is likely to tell those either-way customers what a great store you have. And those disengaged customers are just as likely to be telling people what a terrible store you have. That’s also free advertising – for your competitors. So it’s vital for you to know who’s on your team, and who’s on the other team. And it’s equally vital to know how you can win those either-way customers and those unfriendly, unhappy disengaged customers over to your team. And the best way to find that out? Ask them. It’s as simple as that. If you ask them the right questions, they’ll tell you how they feel, and why. And the best way to ask those question, and to get good, clear, useful answers? 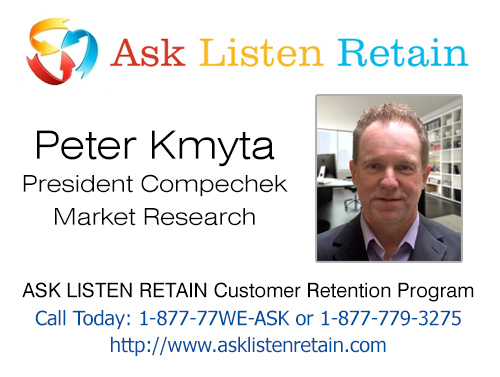 Use the services of a professional consumer satisfaction survey company, such as Compechek Market Research, home of the ASK LISTEN RETAIN program.